Despite seeming like some newfangled hipster fad, siphon coffee makers have actually been around for more than hundred years. In this article we take a closer look at this fascinating brewing method. It’s that peculiar device of glass tubes and burners reminiscent of equipment used in Sci-fi movies and in your old high school science lab. But what does this odd (and cool) looking contraption do, other than making one look like some blend of Portland-hipster and mad scientist when you brew with one? Here’s a rundown of the features, history and what to look for when you’re in the market for one of these awesome brew-machines. This model is super easy to use compared to most other siphons and it makes mouthwatering tasty coffee. The glass and steel construction makes it look very premium. What is a Vacuum Coffee Maker and why does it make great coffee? A Siphon, or vacuum coffee maker, is a “full immersion” brew system. That means instead of boiling the coffee it uses a constant heat source (the burner) to create an internal vacuum that moves the water from one chamber to the next. One of the main advantages of a vacuum brewer is that the water never reaches boiling, which causes the coffee to lose some of its most subtle flavors. 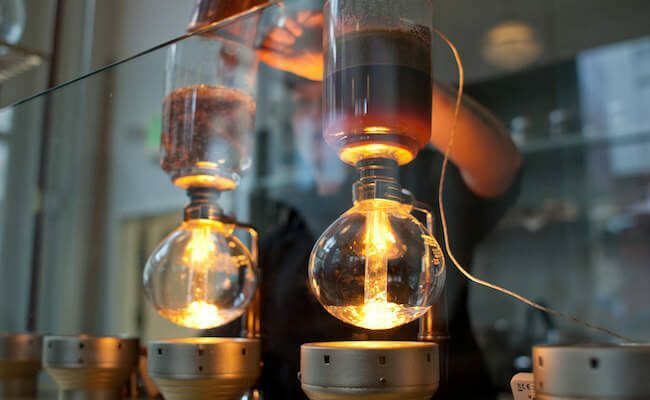 With a Siphon, once the burner is set the temperature remains constant for the entire brew-cycle. 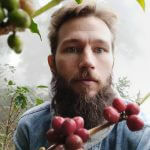 This full “immersion” method is ideal, as the coffee grounds are all immersed in the water for the same amount of time, with the same amount of heat, continuously. The design boasts of two glass chambers, one filled with water and the second with grounds. Heating the lower chamber with the burner causes vapor pressure to increase. Steam forces the water to rise into the upper chamber where the coffee grounds await. The water, now mixed with the grounds, is pulled back down through a filter into the lower chamber thanks to gravity (the “vacuum” effect) leaving you with tasty, perfectly brewed coffee when it’s finished. It’s delicious and it’s science! While a Moka Pot is a pretty cool device and does use pressure like a siphon, the Moka pot still utilizes boiling water to make its brew. Where a Moka has the ability to produce a strong espresso, the methods used in a siphon produce a remarkably cleaner coffee with just as much intensity. It really is all in the vacuum vs. boiling! You can clearly taste the difference. Despite seeming like some newfangled hipster fad, siphon coffee makers – sometimes spelled ‘Syphon’ – have actually been around for some time. The concept dates back to the mid-1800s with the earliest known patent for a siphon-style coffee maker filed in Berlin in the 1830s. Even then people agreed that boiling coffee diminished the flavor and several types of vacuum and vapor pressure machines were put into use. The first commercially successful siphon brewer was designed and sold by French woman known as Madame Vassieux, popularizing this new method of coffee making during the late 1800s. The method was more elegant and more theatrical; a satisfying spectacle for entertaining guests that was much more suitable for the time. And why shouldn’t we enjoy the same? Don’t want to drag yourself out to the coffee shop for your delicious morning cup? Home coffee brewers can easily branch out into the wonderful world of siphoned coffee without having to leave their fuzzy slippers and flannel nighties to do so. 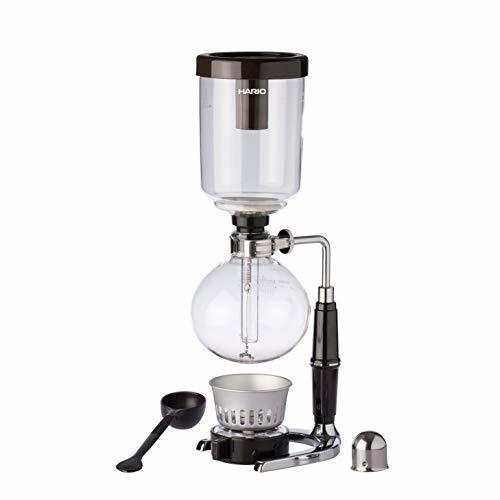 There is a wide range of options for the caffinatedly inclined, and I’m going to walk you through some of the best siphon coffee makers on the market so you can get started brewing your own tasty concoctions (like the mad scientist you are) in no time! 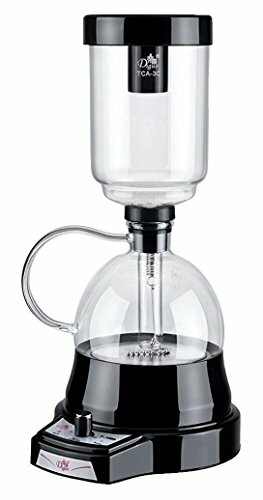 The Hario Technica system is a standalone siphon that uses an alcohol burner and re-usable cloth filters. It has a handy 5 cup brew capacity, is made of heat resistant borosilicate glass and is imported from Japan. 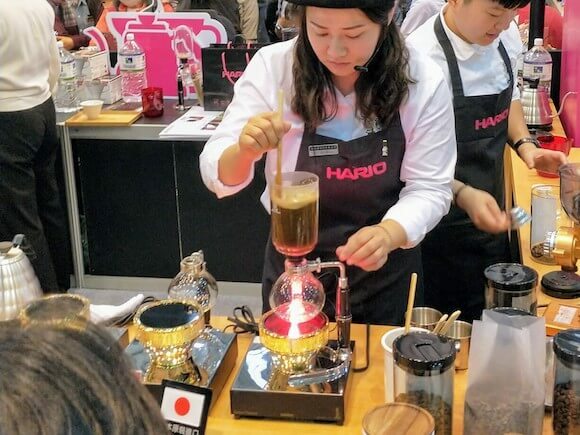 Hario is known for its high quality coffee makers and this one doesn’t disappoint.Of all the siphon systems, this one is the poster-child we all picture sitting in the back of our favorite coffee house. The open-burner and glass carafe fit right in with any crazy science laboratory! Made of heat-resistant borosilicate glass so it is unlikely to break easily. Stand-alone system that is as entertaining as it is functional. The cloth filter can be a hassle to clean. The alcohol burner included is not as efficient as a butane, and you may end up wanting the latter. 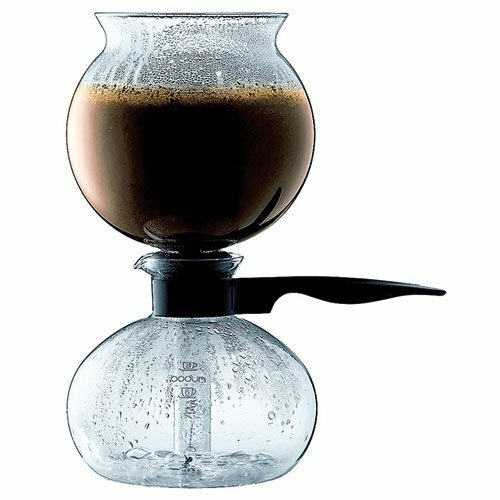 The Bodum Pebo Coffee Maker is a finely crafted product of Scandinavia. Known for its clean, simplistic design it’s no wonder it’s a favorite at popular coffee joints like Starbucks! The Bodum Pebo is a stove-top siphon system, where the lower chamber is flat so it can be placed directly onto the heat source. It is made of two firmly attached glass bowls, can brew a perfect cup of coffee in 5 to 11 minutes, and boasts a brew capacity of between 4 to 8 cups at a time. Can be used on the stove. Has a brew capacity of up to 8 cups. The glass compartments are not as “unbreakable” as the Hario’s borosilicate chambers. With use and time the Bodum may lose its tight seal, causing drainage issues and making a miserable mess. The siphon brewer for the modern age! The Gourmia Premium Siphon system is electronic, cordless and has a one-touch interface! More like the electronic drip-pot you may be used to, this sleek and edgy system can sit on your counter-top and unlike the ones requiring a burner or open flame, this one is self-contained. Electronic and cordless. No need for a burner or stove. One-touch interface with temperature control and “keep warm” mode. Beautifully designed. Has both the modern aesthetic to match your other kitchen appliances while still retaining that lovely sense of theatrical wonder while watching your coffee make itself. Cloth filters are difficult to clean and even harder to replace. Brew capacity is only around 3 cups. Another self-contained electric siphon! The Diguo New Generation Siphon has a 3 cup capacity. It has an electric base with adjustable heat control and can brew you a tasty cup in about 5 minutes. Like the Gourmia, it has a sleek, modern look while still retaining that aspect of cool. It can easily take up residence on your counter-top alongside all your other kitchen appliances and still be the hip new kid on the block. Electric base. No burners or open flames. Makes your brew in 5 minutes or less. Top glass cylinder is extremely delicate. Even the lauded KitchenAid brand is embracing the siphon coffee maker with their own electric version! 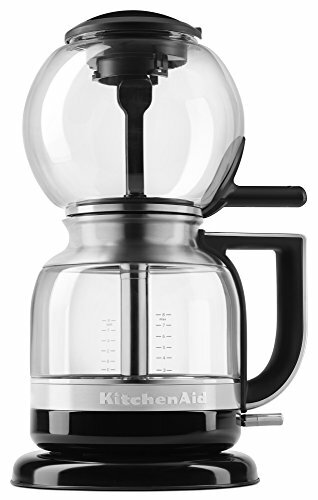 The KitchenAid KCM8120B Siphon Brewer boasts of an automated full immersion siphon “delivered though precise temperature and vacuum technology”. It is made of premium glass with stainless steel accents that lend to its sophisticated and modern design. 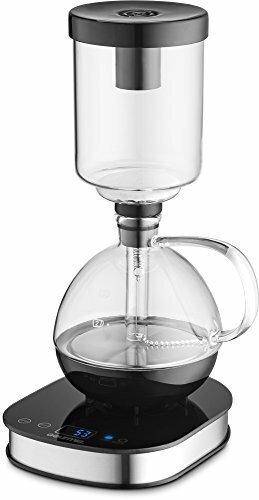 It has an 8 cup brew capacity, a magnetic locking seal that securely fastens the unit together, and comes with both a steel filter and a cloth filter pack. Comes with both steel filter ad cloth filter pack.Electric. Sleek design made with sturdy glass and stainless steel accents. No open flames or burners required. You already know a lot about this magnificent gravity coffee maker. But here are some other things to consider. Choosing between a standalone electric Siphon or a stove-top is really a matter of preference and aesthetics. In terms of brew quality there isn’t much difference. The Stove-top, as its name obviously implies, is designed to sit atop your stove, using its flame as the burner. These tend to be a bit more simple and less expensive than their flashier standalone counterparts. The standalone, on the other hand, has its own stand and built-in burner (using either gas or alcohol) that rests just below the bottom chamber where the water is kept. These tend to have bit more flair in their design but otherwise function just the same. As with any coffee-maker, the brew amount you require is determined by your own particular needs. Vacuum coffee makers brew in various batch sizes, typically ranging from 3 to 8 cups per brew. Who can deny the curious appeal of a siphon coffee maker? They’re elegant, aesthetically pleasing and make one amazing cup of coffee!